Wednesday (4 days to D-Day), I had to neglect Casey for the day and report to work, which was an amazing blessing. I can't believe the thoughtfulness of others. I had burned up all my leave to be with the girls and it was another source of stress when we considered the change in our finances. But it was something we prepared to just accept. Then I received a call from my workplace. Raelynn, an angel in the finance department, had somehow crunched numbers and figured out a way to extend my leave for another two weeks if I came back to work for one day. Are you kidding me? I dropped everything and sped off to Alapai. I really missed Casey but it was nice to see my crime-fighting peers. While at work, I received a call from the hospital. Casey had a choking episode during a feed that was severe enough that they had to evaluate whether she needed to be kept another week. After considering all factors, they decided it was safe enough for her to come home on Sunday. Phew, sigh of relief. After all the arguing I did with staff to keep her in the safe confines of the hospital as long as possible, I was so disappointed when I thought she wouldn't be coming home that weekend. Thursday (3 days to D-day)-no idea. That day is a blur. Friday was an awesome day. First, Casey had to pass her carseat challenge. I liked that they call it a challenge, it makes it seem more fun. Like she's taking on an American Gladiator. It's slightly more tame. Really, she has to sit strapped into her carseat for 90 minutes while being monitored. 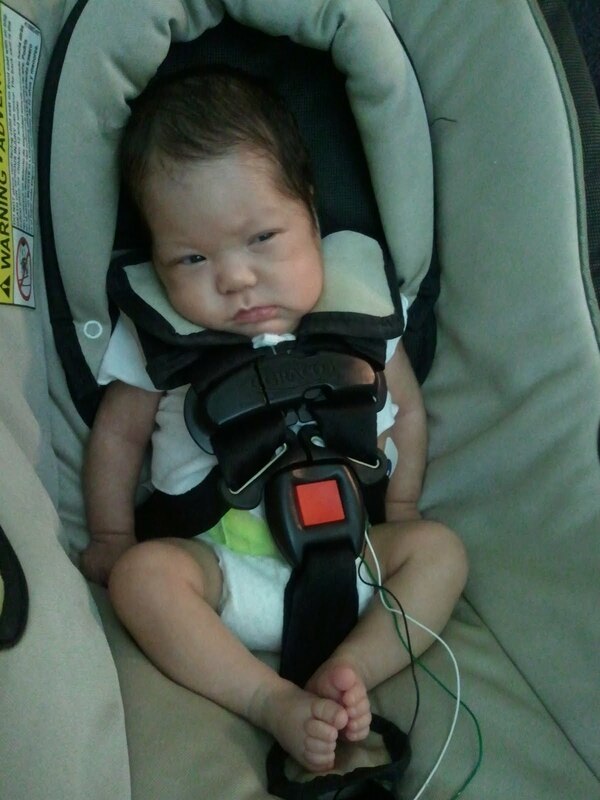 It's to ensure that she can keep her oxygen and heart-rate up during a car ride. Babies slightly slump when they're in a carseat and they have to watch how it affects Casey's breathing and oxygen levels. They say the challenge is 90 minutes long because that's a safe time limit, on this island you can drive anywhere under 90 minutes. Maybe I made that up. She didn't look that happy, but the nurses said she seemed to love it. She got this car seat from her cousin, TJ, who outgrew it very quickly. Thanks, TJ!!!! Casey loves it. They did the carseat challenge before we arrived at the NICU, but another one of Casey's nurses, Eva, had us practice putting Casey in her carseat. At first, I didn't want to do it because I was impatient and we were getting ready to room in (see part 2 of this blog to follow). I thought "how hard can it be?' But, boy, I am so thankful that Eva made us do it at least once in front of her. 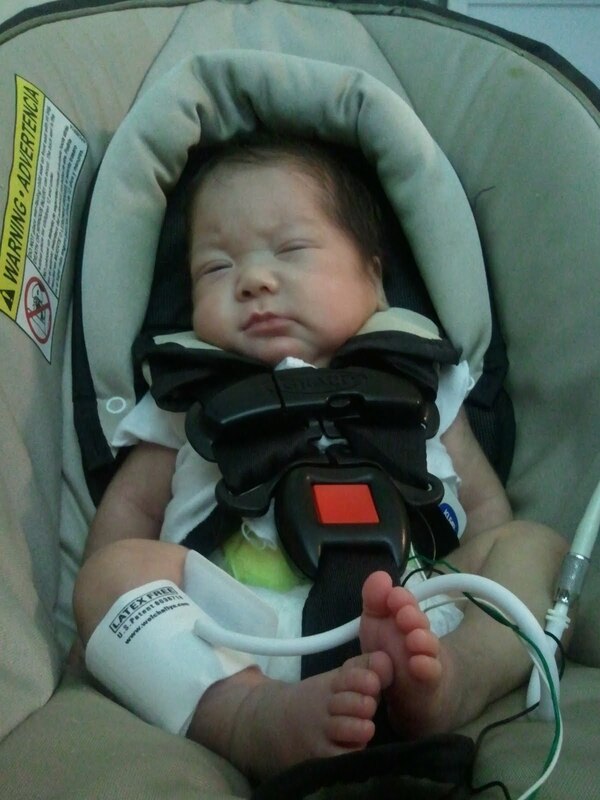 When Casey was finally discharged, we had to be the ones who strapped Casey into her carseat and placed her in the car. It makes sense because it was the final piece of Casey's discharge. She was no longer in hospital care, she was now in our care. She was our baby and it was nerve-wracking to place her into our car. So, Eva having us practice in the NICU with her right there to guide us there was priceless. By the time we took Casey home, I felt comfortable in knowing where to position the buckles and how to tighten the straps. The real fun on Friday was being able to room in, staying overnight in the hospital and taking care of Casey on our own for the first time. That's part 2 of this story...coming up. She looks super pissed to be confined to that car seat. I'm glad she's so much better in car seats now.